This month America got uncharacteristically amped to see a shadow. Millions packed into planes and cars and RVs and took trips they didn't know they needed for an event that lasted all of 2 minutes and 41 seconds, at best. That the apex happened to land between the red-hot vacation destinations of Carbondale, Illinois and Hopkinsville, Kentucky didn't deter the masses who spread across a dozen states to gape at the total eclipse. For many travelers, this felt like a once-in-a-lifetime chance. Scientists, too, have been eyeing this 2017 event as a special one, for decades now. The eclipses of 1945 and 1954 started too early in the day and headed to Canada. 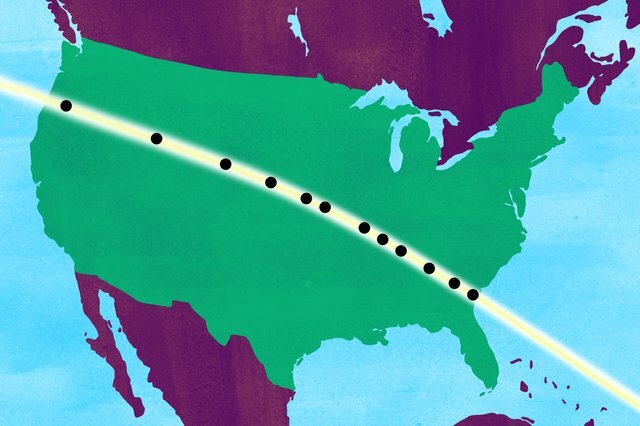 The eclipse of 1970 only hit Florida; in 1979, another appeared in the US before going north. Astronomers all the way back in 1932 rued their "amazing conclusion" that America's next great opportunity to study a total eclipse would be none other than 2017. But if you didn't make it to this path of totality -- the 70-mile-wide stripe of darkness that put the "total" in total eclipse -- we still have you covered. Our writers fanned out across the country, to cities and campgrounds and impound lakes and grasslands and the in-laws' and a private jet to capture that ephemeral moment of sudden sunless chill that dropped jaws across America. They'll have you looking forward to the next big American eclipse, in 2024. Practically around the corner. Half an hour ago, I helped two friends line up our second telescope with the scoreboard at the local high school. It displayed a countdown to the totality. It’s the nerdiest thing I’ve done in quite some time. This eclipse morning felt more than a little post-apocalyptic in Madras, a town of about 7,000 that over the weekend became one of the biggest towns in Oregon. Tent cities sprang up. Cars were parked, lining highways that normally host a car or two every hour. National Guard troops were on site at the entry and exit of town, on station to deal with the traffic influx. Over the past four days, we’d seen two brush fires, an abandoned home burnt to the ground, and a fatal crash of a single-prop airplane. Yet through the siege atmosphere no one could ignore the gathering energy and excitement. As the eclipse approached, we put tarps on the ground and donned our eclipse glasses to gaze up. When it was my turn at our solar-filtered telescope, I knew exactly what to expect -- and yet, when I see the clear circle of the moon sliding across the waning crescent sun, I laugh involuntarily from the simple joy of it. We were warned that it could be the busiest day in the park’s history, but out here, overlooking Jackson Lake -- one of America’s most iconic vistas -- spirits are high and the pre-gaming is strong. Breakfast burritos and coffee are being served out of campers and RVs to complete strangers, and there are tripods, telescopes, and lawn chairs to go around. Fearless swimmers strip down to their bikinis and board shorts and float onto the lake’s choppy, chilly morning waters on blow-up air mattresses. When everyone cheers them on, I decide to join in, baptizing myself in case it's my last swim ever. As the moment draws near, swarms of mosquitoes arrive, and in the quickly evolving light, patches of snow on the Teton Mountain Range soften and the wind dies off. The enormous Jackson Lake becomes a glassy pool of still water. The sky erupts into an ombre of tangerine and crimson, and the crowd erupts back. We whistle and holler, pointing iPhones and cameras in every direction, trying desperately to capture a fleeting moment that lasts 60 seconds. By nightfall on Sunday, more than 1,300 people had gathered near the Orin Junction Truck Stop off I-25 in southeast Wyoming. With only 46 permanent residents, the former railroad town saw its population multiply 30-fold as eclipse watchers from as far away as Hong Kong made their way to its considerable open spaces. The town's few residents welcomed the pop-up popularity, staking out campsites on their properties and hawking eclipse glasses and Wyoming souvenirs from their yards. Behind a ranch house near the highway, a man in a cowboy hat poured shots from the "blackout saloon," a full bar perched amid the hay bales in the family's arched quonset hut. The bar's patrons sipped Wyoming-made whiskey while line-dancing to ‘90s country hits. I’d meant to watch from North Platte, Nebraska. Twenty-five hours before the eclipse was set to hit, families gathered under the TV in a hotel lobby munching complementary waffles and heard the verdict: cloudy skies. “What are you going to do?” asked a woman as we took the elevator back up to our rooms. She’d booked her hotel room in January and driven six hours from southern Colorado. She was considering testing her luck in the tiny towns on the windswept plains just north of I-80, each of which had planned eclipse-watching festivals. After consulting with cleardarksky.com and maps, my family decided to try our fortunes west, along the Oregon Trail. We stopped at Walmart for rudimentary camping supplies. Then we drove through cornfields, into green rolling sand hills, and passed the pioneer landmarks Chimney Rock and Scotts Bluff. Our promised land was a 40-acre field next to Glendo Reservoir in Wyoming, directly under the path of the totality. Monday rewarded us with bright blue skies. A stiff wind kicked sand around rows of RV, tents, and cars. The vast landscape and shared purpose made an instant community of us pilgrims. People passed around telescopes and pizza pan- and colander-pinhole cameras as the moon began to cover the sun. Hot-air balloons passed overhead. Fifteen minutes before totality, the air cooled, and an eerie haze made it seem as if you were wearing sunglasses. For reasons I'd prefer not to fill out here, I'd been awake for two straight days come Sunday morning when I landed in Minneapolis to join my friend Jeff on his road trip to California. Jeff drove us six hours to an Airbnb on a South Dakota farm. The proprietor suggested Nebraska for the eclipse: a wide-open spot where we could simply pull over. In the morning we drove as far as we could on the road that went west. In Crawford, about an hour before the moon began to consume the sun, we turned onto one that went south to venture further into the Zone of Totality (which moniker I can only hear in a truck-commercial narrator's voice). Traffic was hell after the moon outpaced the sun, but the morning was mellow. We saw maybe two dozen viewers scattered across roadside prairies. At 12:59pm, mere minutes before the the totality, a thin crescent sun began to peek from behind the clouds. The crowd -- in from as far away as Texas, England, and Australia -- began to stand up, gesturing wildly and exclaiming at the sky with a mixture of amazement, disbelief, and relief. The cool northerly wind picked up, and the sky above turned to dusk. The horizon, lined with low-lying storm clouds, lit up like a deep, orange ocean. The wind died. The crowd roared a countdown: 3, 2, 1. Whoops and screams filled the air. Safety glasses were off. A black orb hovered in the sky, edged by a pulsating ring of brilliant light. Our world was night, with the only light coming from far on the horizon and the occasional flash bursts of cameras and cell phones. More cheers went up when stars appeared in the southern sky. Today the people of suburban Kansas City learned to cuss a cloud. We’d been glued to weather reports that suggested rain. At around 11, two hours out, the morning clouds broke and the air heated up. About 45 minutes from totality, a small crowd gathered atop a hill, around the out-of-service Charles Smith Scott Memorial Observatory. From here, we could see a couple miles south, into Kansas, and west, where thick clouds gathered ominously. Thirty minutes before totality: Wispy clouds wandered across our sky. As the sun sliver got skinnier, the clouds got thicker and darker. Fifteen minutes till totality: It was getting dark, thanks to the clouds or the moon or both. Birds took note, in any event, and sang evening songs from the trees. The temperature dipped. Things went from hot and humid to plain ol’ humid. When the partial started, my 10-year-old joined me on the back porch of a house in the St. Louis suburbs half a mile from the Missouri River. “I don’t see any difference,” she said. She returned five minutes later and looked up to see a sliver of the sun missing. “Oh, yeah!” she said. Two seconds later she went back inside, as it was 90 degrees out. My lasting image: It’s the only time in my life I’ve seen darkness literally descend. When the full eclipse started, a gray tint fell from above my protective glasses to below. Someone a few houses down cheered. My daughters screamed and danced as if they’d just walked into the living room to a pile of presents, having forgotten today was Christmas. The morning of, people fueled up on biscuits and gravy in motel lobbies, many in matching T-shirts with legends such as “Party in the Dark” and the ominous-sounding “8.21.2017.” For the next several hours, they would swelter under a sun they wanted to see disappear. On the north end of Kentucky Lake, groups set up for a cosmic picnic. “I’ve been waiting for this since 2012,” said Paul Warden, who once raced across Michigan to see a partial eclipse, only to sit beneath full cloud cover. A loose few cirrus clouds graced the sky today, and just before noon, we donned our specs to find that a black nick had formed on the sun’s upper-right edge. The next hour was a teaching moment across generations -- a New Zealander named Ron Paine, for example, “played a little astronomy” with his grandkids by holding a kitchen colander above the pavement to show off dozens of tiny crescent suns. At 1:18pm on the rooftop terrace of the 26-story Nashville City Center, some law office employees are on the most interesting lunch break of their lives. Or so they’ve been told. So far it’s cloud then no cloud, cloud then no cloud. As soon as a clerk nudges his starry-striped glasses up his forehead in frustration, a waning slice of gold is again peeking through a winder. Folks in Music City have been carrying on about the eclipse all month, from the TVs to the preachers to the country singer John Conlee at the Grand Ole Opry, who announced his firm belief that a solar eclipse is nothing if not clear proof and evidence of God himself. Tickets to rooftop shindigs at Acme Feed & Seed were no joke at $200, and totality T-shirts were selling out like moonshine. But at 1:25pm on the roof, all the fussing seems a little pointless. A thick, indifferent cloud eclipses the eclipse. At 1:28pm, totality is upon the law office employees, and though they cannot truly bear witness, there do seem to be signs: The air feels full, as if it might rain, and a flock of confused pigeons takes flight. The sky dims so gradually it's almost imperceptible, and the streetlights and headlights are aglow, and then the horizon is blushing like undercooked hot chicken. For two minutes of this lunch break, it feels unmistakably like dusk, and the law employees will remember it for a long time. The light slowly returns and all is as it was, with clouds still sprawled across the sky. The great fear of eclipse-chasers the nation over was fluffy white clouds on the day of the most expansive eclipse America has seen in a century. So Victor Private Jets, a sort of Uber for private aviation, had the idea to wrangle a nine-seater Hawker 1000 to fly east out of Nashville, Tennessee. Even flying near 500 miles an hour, we wouldn’t get much extra totality -- not when the shadow was moving at some 1,800 mph, well above Mach 2. But, guaranteed: no clouds. Seen from above, or Google Maps, Nottely Lake in North Georgia looks 17 square kilometers of softly jagged ink spill, the kind you get on thick paper. From a little south-facing shoreline at noon today it looked like a playground: two dozen or more jet skis, speedboats, fishing boats, kayaks and all the other buzzing and churning and slapping craft sending little waves lapping into our chests. On land, there was country music playing, a grill smoking, almost everyone but us having turned up in pickup trucks and 4x4s. At about 2pm we noticed a plane, seeming as high-up as you see transatlantic flights, drawing a huge slow circle. A dog yapped and splashed. Then at 2:25pm or so, the light dipped and the trees and lapping water and pickups suddenly became a film-set: a dimly-bright and silvered-orange spotlight that made my hands and all of everything else solidly unreal. Then it all stopped. There was a scream, cheers, a "Hell-yeah science is real!" but those boats and kayaks were still and that plane I’ll swear till my last day had stopped dead, its lights winking ­next to a star come to shine at 2:30pm on an August afternoon. Eclipse-chasers gave Greenville the feel of a college town hosting a nationally televised football game. The families jamming the street wore “Line of Totality 2017” T-shirts, and hotel lobbies felt like those I’ve seen in Miami during Super Bowls. But the only actual game happening in Greenville Monday was single-A minor league baseball: the Greenville Drive against the West Virginia Power. As the third inning turned into the fourth, the brutal Carolina heat began to subside under the moon’s shadow. As the fifth inning started, the stadium began to dim, and players dealt with shadows like they might during twilight. As the Drive’s Mitchell Gunsolus struck out to lead off the bottom of the fifth, play was stopped and fans began to pour onto the field. The day game became a night game in a matter of seconds. As totality hit, the PA announced it was safe to take off our glasses. The sliver of sun that peeked out from behind the moon looked like a stadium flood light. 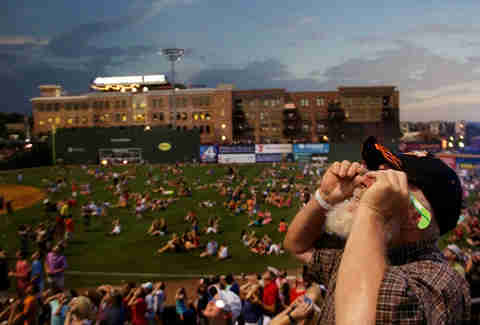 The park was wreathed in a 360-degree sunset, as pinks and deep blues peeked up from over Fluor Field’s Green Monster in left field, and from the treetops that sat outside the first base entrance. The crowd basked in the cooling relief of the eclipse; while the air was still humid, the sultry August afternoon was tolerable for a couple of minutes. Three seconds before totality, I watched the minnows take flight. The tide was low on Conch Creek, which slithers through the marshlands that separate Mount Pleasant from Sullivan’s Island just north of Charleston and spitting distance from the Atlantic. Below where we stood on the pier, crabs reached for the tops of traps, as if to try to get a better view. Clouds spread apart. A storm to the west stopped flashing. From other piers in the distance came the sounds of people screaming like ghosts. Charleston’s nickname is Holy City, and throughout time, it’s had lots of reasons to pray and to confess. These marshlands have seen some awful things. In 1989, there was Hugo, the Category 4 hurricane that came ashore on Sullivan’s Island, birds filling the sky in its eye. From the 1600s to the 1800s, some 40% of African slaves brought to North America came through Sullivan’s Island. Holy City has many sins. And yet I couldn’t shake the sense that the eclipse was, at some level, a spiritual event sent by providence to this spot, 2,485 miles from the Oregon coast. It found us in the Southeast at a simmering moment for our country, to send people yawping into the darkness of day, to make the Spanish moss glow as it danced from the arms of live oaks, to set the sun all around us, to remind us that everything can be the opposite of what we believe it to be.